My intended method is to give the cows the amount of grass they can consume in one day and then move them off of that area and onto another days worth of forage. There are several management objectives in this strategy. 1. 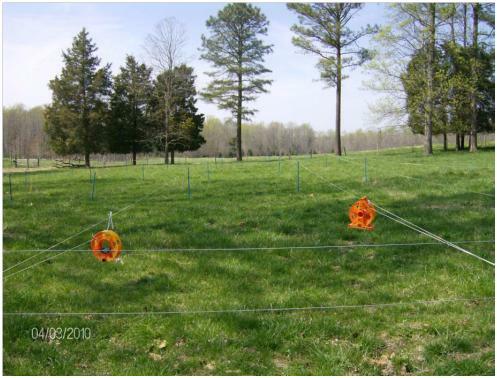 Increase grazing efficiency. By having less area to walk over and select from the cows should harvest what is available to them in the given area. They will still eat the chocolate first and leave the brussel sprouts alone but they will do it over a more concentrated daily area. 2. The uneaten part will be trampled down and contribute to the organic matter of the soil. 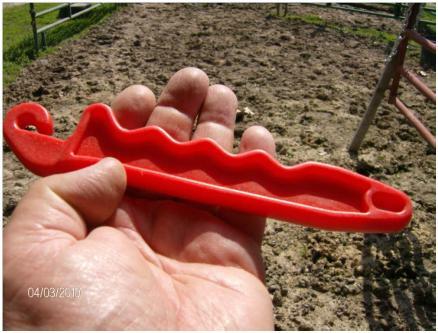 By concentrating the cows on a smaller area the hoof action on the area is increased. 3. Hopefully we will somewhat increase the manure deposition on a given area. the challenge will still be to get the cows out of the shade in the summer time which is where they hang out and concentrate the manure. 4. Increase the rest time for the forage between grazings. The rest time, is when the plant recharges and builds root reserves. Continued grazing stresses plants and reduces plant species diversity. 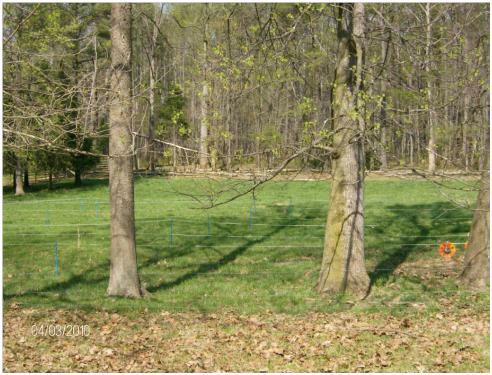 My ambition is to establish deep rooted and diverse forage plants that will improve the soil. 5. Leave and increase organic residue to contribute to soil building. 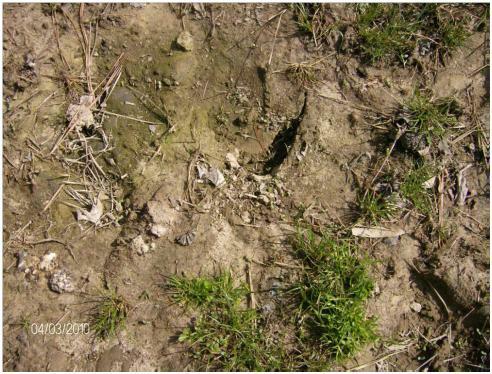 This residue may be manure or uneaten plant residue. 6. Reduce chemical inputs and raise forage in concert with nature. 7. Increase plant species diversity. I wish to have a forage base that will serve us in cool season as well as the heat of summer. 8. Reduce usage of stored feeds. I want the cows to graze as mush of the year as possible and feed less (in volume ) expensive hay. Initial goal is to graze for 300 days once we begin. We certainly had 65 days of winter this year and I must be prepared for that and more. I will not begin the formal grazing strips until the grass is ready. I estimate this will be mid April. I have a grazing stick and want the grass to be a minimum of ten inches tall before we begin grazing. I am carrying cows on hay until we get to that point. This will also coincide with the plan to wean the calves about the same time we begin grazing. The calves will have to be confined away from the cows for a couple of weeks and a couple of lots have been set aside for this. This will allow the cows to begin to put on some condition and be ready for calving again in September. They milked well and are a bit thin, but they are bred back . I have already laid out the strips for the first week. We will begin in the lot known as the corner. I am eyeballing and guessing at the strips and the first week will be a learning experience. Hopefully I will get better at estimating forage availability and need with practice. I made an educated guess this time and will adjust on the fly. Simplicity of layout is also a factor. I am pacing distances rather than measuring. this photo shows six lanes laid out across the bottom of the lot with each lane made by one strand of polywire. The leaves in the foreground indicate a small lot what has not been used since fall and the cows are there right now cleaning it up. I put them there to enable me to let courts heifers access the barn for herd health work without Sam getting all emotional. this is a view down the daily grazing lanes. The grass is currently 5 to 6 inches tall in these lanes. Clover is abundant with the wet year we have had. This lot was broadcast with ryegrass and hairy vetch and lespedeza in mid March. However almost every lot has been broadcast with some sort of seeding so we have to start grazing somewhere. The Ell actually has a bit more grass by volume but I desire to favor the bermudagrass out there and plan to take off the cool season grasses as the Bermuda breaks dormancy. this is what I refer to as an economy grazing wheel. 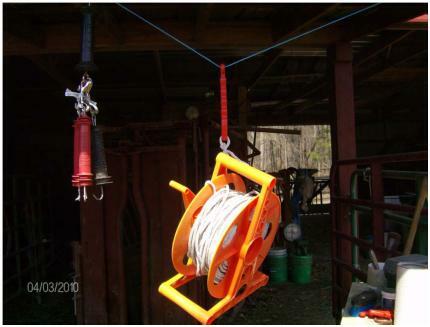 The grazing companies sell nice metal and composite ones that should last a lifetime and they have hooks for hanging them up and they are very nice. They also cost about forty bucks each. This plastic extension cord reel cost less than eight bucks at home depot. This one has poly rope on it. I had a partial spool of poly rope. Most have 220 feet of polywire on each reel. 220 feet is probably as long a run as I will need to make, and the polywire comes on 660 foot spools. I put a no kick handle on one end so that I can unroll off of a hot fence if needed and rig up a regular handle with a double end snap on the other end so that I can quickly adjust and tension and hook up. A no kick handle is a pretty simple affair. A piece of plastic with a hole in one end and a hook on the other. Since I have broken one already I may figure a way to make my own. 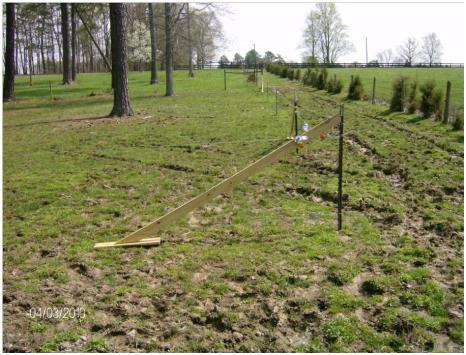 This is something neat I discovered on the Powerflex fence web site. It is called a floating brace. It is an answer to the needs of an arthritic old mans wrists. No need to tamp post or dig a hole to set a brace. Since I was only putting up one wire here, I cheaped out and used pressure treated 2X4 as the brace. For more wire a 4X4 would do better but other than that it is great. The foot is a two foot long section of pressure treated 1X6. I attached it to the 2X4 with a couple of screws. 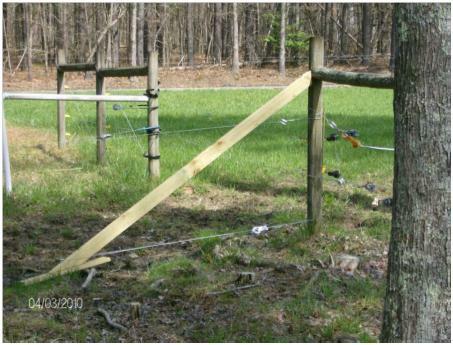 I attached the top of the 2X4 to the post with wire and tightened the brace with a fence strainer. The brace will bend the post. Works on a wooden post as well. This one is at a funny angle because the foot is actually sitting on a tree root. Should not sink in the mud. It is muddy in that spot now. The fence strainer is easier to see in this photo. One of the screws I used is an eye bolt screw and I ran the wire through the eye to prevent creep or splitting the brace. 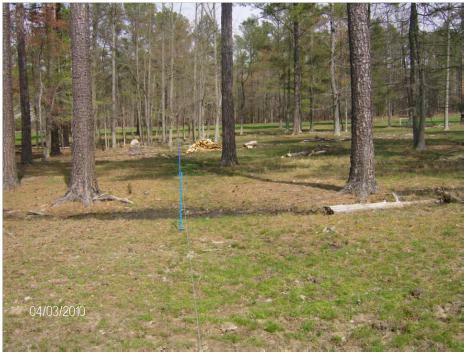 VDOT puts water on my property at four different points across my short road frontage. We have had a LOT of water this winter and my place is still damper than most in the area. Star Baby loves to run and spray mud. on the right in the photo is a new area that we fenced in and broadcast two weeks ago with rye grass, hairy vetch, lespedeza and some leftover tillage radishes. Just getting the horses off of it has started it to green up compared to left of the blue posts where they still are. The blue posts are Obrien Tread in posts. They are far superior to the ones in the feed stores around here and are no more expensive. They are made with a better resin and are much stronger. The lespedeza is beginning to sprout …..Look closely in the track……. The ryegrass and the vetch are not yet visible. Some of the tillage radishes seem to have sprouted as well. Could not get a good picture of them. Aim to begin Grazing around Tax day and will report more then.